Thanks for stopping by to see what we are doing here! Made Beautiful by Scars - Transformation Stories PAPERBACK NOW OUT! 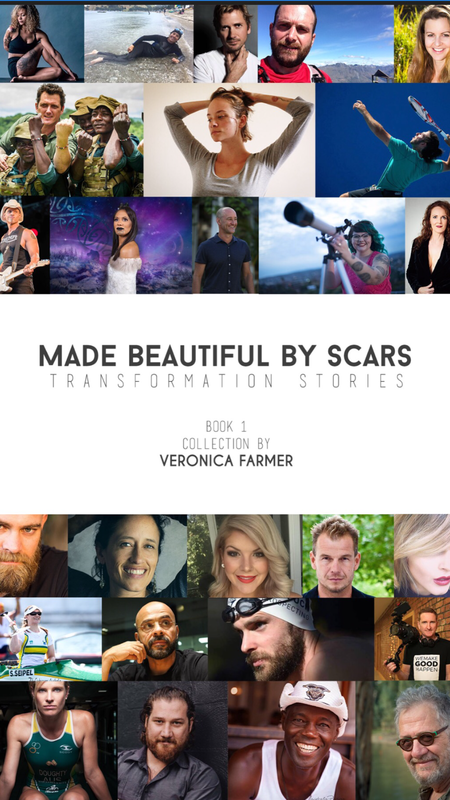 Made Beautiful by Scars is a global story movement for change around how we see our life scars collected by author and therapist Veronica Farmer from Brisbane, Australia. This book is a collection of some of the SCARS series most popular reads over the last 12 months. These stories are being read all over the world and have created an online community of story-tellers and readers coming together to share wisdom and insight for overcoming some of life's most challenging life scars. We learn so much from these great wounds of life. So why do we keep some of life's greatest discoveries forged in fire hidden away? In sharing the depth and the learnings of our scars, we create a roadmap of healing for ourselves and others. Made Beautiful by Scars is where men and women storytellers share journeys of a richly lived life.